For the past fifteen years Reuben Margolin been working on a series of monumental mechanical mobiles inspired by water that combine the logic of mathematics with the sensuousness of nature. 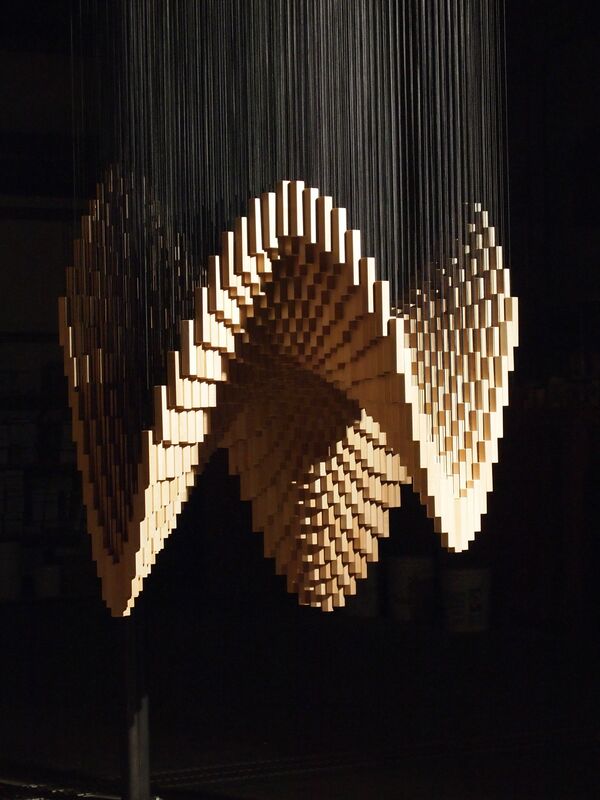 So far he’s completed over twenty suspended installations that undulate in different patterns. Reuben was raised in Berkeley, California. A love of math and physics propelled him to Harvard, where he changed paths and got a degree in English. He then went on to study traditional painting in Italy and Russia. In 1999 he became obsessed with the movement of a little green caterpillar, and set out to make wave-like sculptures. In 2004 he moved to his current studio in Emeryville and began making a series of large-scale undulating installations that attempt to combine the logic of mathematics with the sensuousness of nature. He has since made about 20 of these mechanical mobiles and shown them internationally. He also makes pedal-powered rickshaws and has collaborated on a couple large-scale pedal-powered vehicles.